Kiss the Cook--A Sneak Peek! Is everyone ready to get that holiday baking underway? I'm pretty sure I'll be doing a little this year, with money kind of tight and all (Our Christmas is going to be lean and mean!). Cookies, breads and candies really make for some nice and inexpensive gifts (I'd like to try my hand at making Caramel Turtles--anyone have experience? ), especially for teachers, neighbors and coworkers. So when I saw this new set, Kiss the Cook, from Storage Units, Ink and More, I knew it would coordinate nicely as some fun packaging to make the baked goods even more yummy looking! I love that little oven! 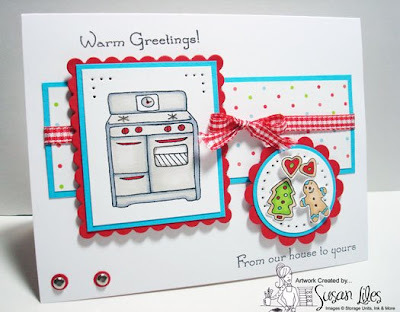 To get me started with this set, here's the first card I made with it using Julee's Mojo Monday Sketch #58 (that is so easy, too)! I colored the images with Copic Markers and kept with a "fresh" color scheme, drawing inspiration from my designer paper from American Crafts (my favorite!). When I was tying the tiny bow of ribbon, the ends started to fray. I thought they looked cute just as is and how it juxtaposes the crispness of this card, so I kept them that way (didn't want ya'll to think I missed a trimmin'!). It reminds me of old oven mitts and how they get so worn out--sort of conjuring up a cozy, home-baked feeling! To tell you the truth, I couldn't stop thinking of the Pillsbury doughboy while making this one! Hm--Hmmmmm! TIP: Accent brads with a coordinating cardstock by punching circles with a regular hole punch. Place them on the foam pad from your Mat Pack (SU!) or a mouse pad and pierce the center. Rather than handle these tiny dots, leave them on the pad and go ahead and stick the brads through them. Then they are ready to go on the card. Susan-- This is just ADORABLE!! I just love this set and the fun bright colors are perfect for it!! This is just the cutest little card! I love it! I love the image of the stove and all the white. Super cute! And I LOVE your color combination! Oh my gosh how funny! We used the same sketch for the sneak peeks. Who would believe. I love this card. Now every time I use this set I will be thinking of the Pillsbury doughboy too. Funny. Fabulous job on the sneak peek, love the way you colored these images. Oh Susan this is just darlin'!!! Love the retro look to your card and the way you've used this set. What an adorable card I love all the details. My dd and I start baking Thanksgiving weekend and go right through until New Year. I have never tried the home made Turtles but here is a simple and easy recipe that gives you a simular result. Now basically you need as many Pretzels, Rolos and Pecan Halves to match the # of finished product you want. I usually buy a box of Rolos from my local discount store (Costco, Sam's Club, Smart and Final or what ever is in your area) because it is less exspensive then buying them in singles in the grocery store. I also buy my Pretzels there too because you can get a good deal on those along with the Pecans too. WARNING THESE ARE AS ADDICTING AS POTATO CHIPS AND NO ONE CAN EAT JUST ONE SO BE SURE TO MAKE MANY. On a non-stick cookie pan (the kind with sides) lay your pretzels a little bit apart and put as many as will fit on your size tray. Now you will put one Rolo Candy on top of each Pretzel. Now carefully put the tray into the oven for approximately 7 to 8 minutes. In the mean time in a bowl count out a Pecan Half for each Pretzel on your tray and set aside but keep close to the oven. When you check on these the Rolos will have kept there shape but when you touch one it will feel very soft and melty. Carefully pull the tray out of the oven and set on a cooling rack. Immediately put one Pecan half on top of each Rolo and push down until the Rolo is almost flat on the Pretzel. You may want to buy a couple of rolls of Rolos at the drug or grocery store and try these to get the hang of them before you make big batches. These make great gifts for a childs teachers and classmates. They are also nice to add to a cookie tray. ENJOY!!! Love this card, it is so cute! I've never seen a stove stamp. So cute!! I love that little oven! I love what you did with this set Susan! super cute!! Susie: Take 1 can of Eagle Brand or Pet condensed Milk, pour into top section of double boiler, place over boiling water. Lower heat and simmer 1/2- 1 hr stirring occasionally. It will turn into caramel. Drop blops of the caramel onto waxed paper (NOT plastic wrap)put on the pecans, coat each blop with the chocolate of your choice....Dove works well or you can buy the chocolate made for cany making. Chill until set. I love making these, but I eat too many so will not be doing it this year. This is so stinkin adorable!! Love it! !